Your best new prospect is driving by your business everyday � how do you effectively change their buying habits? Grab the attention of your daily drive-by and on-premise customer using the most cost-effective advertising available today - Outdoor Electronic LED signs. Replace, augment or eliminate traditional forms of costly advertising with instantly recognizable on-premise electronic advertising. Attract attention and advertise to the people who pass by your business every day. Increase sales from 15 - 50% with �Top of mind awareness� and your drive by audience. Change your on-site advertising on a regular basis with no additional cost. Advertise daily specials and upcoming events at a moments notice. At ElectronicSigns.com, Ltd, we have a variety of outdoor displays which include single color, full-color and video options for your outdoor advertising needs. Our displays are controlled through specifically designed software that offers the flexibility of scheduling messages, presenting graphics, and even displaying real time information. Our displays are rated for over 100,000 hours of continual use, carry less than a one percent failure rate and have a five year extended manufacturer�s warranty. 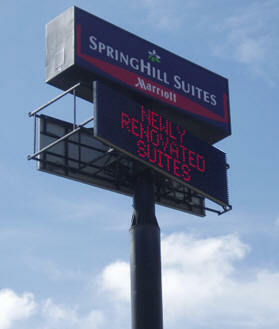 For more information on our LED Signs, please feel free to contact us at 800-341-6397.